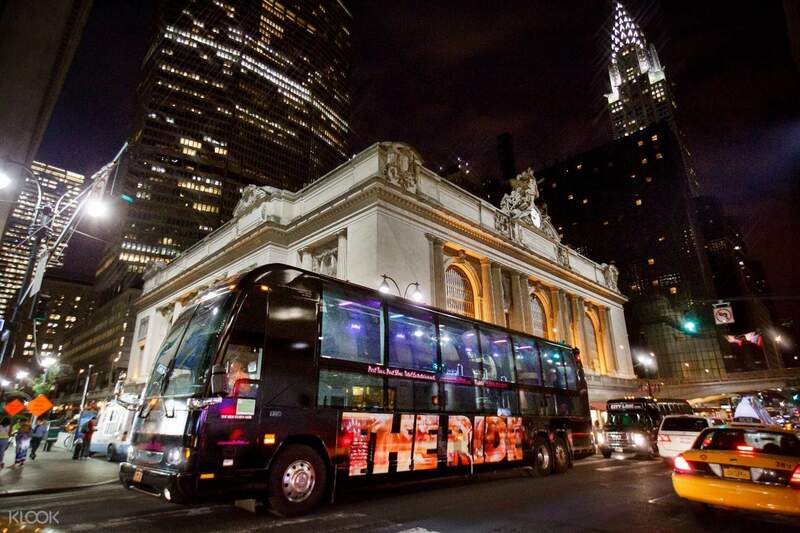 Hop aboard the multi-million-dollar bus coaches known as The Ride and experience a very unique and entertaining bus tour around New York City. 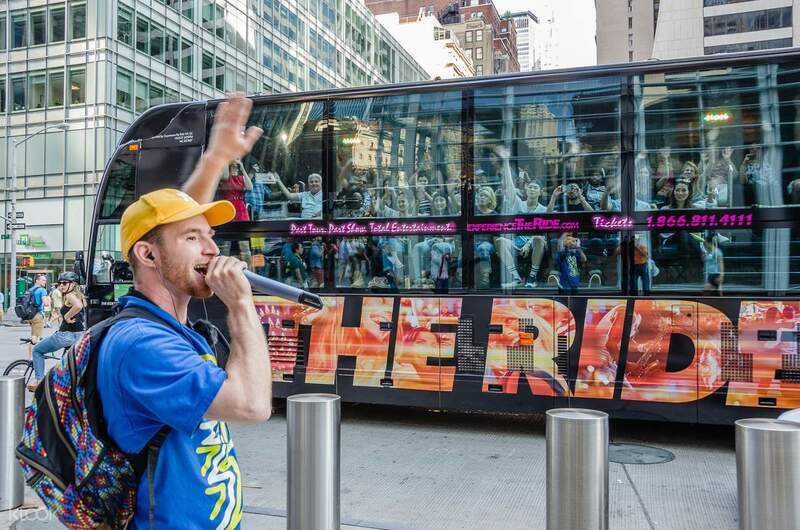 Sit back and enjoy the tour's incredible street performances against the backdrop of some of NYC's most iconic landmarks including Times Square, Columbus Circle, the Chrysler Building, Grand Central Terminal and Bryant Park. You’ll explore the city in a completely new way through our floor-to-ceiling glass windows and stadium style seating! Catch and be entertained by live street performances such as ballet dances, hip hop dancers, and freelance rappers. Not only that, you'll also be entertained by award-winning hosts who are trained in improvisation, this will give each performances a fresh take depending on what's happening that day. This tour is new, it's fresh, and it's different, and it's something you should definitely try while visiting New York City. 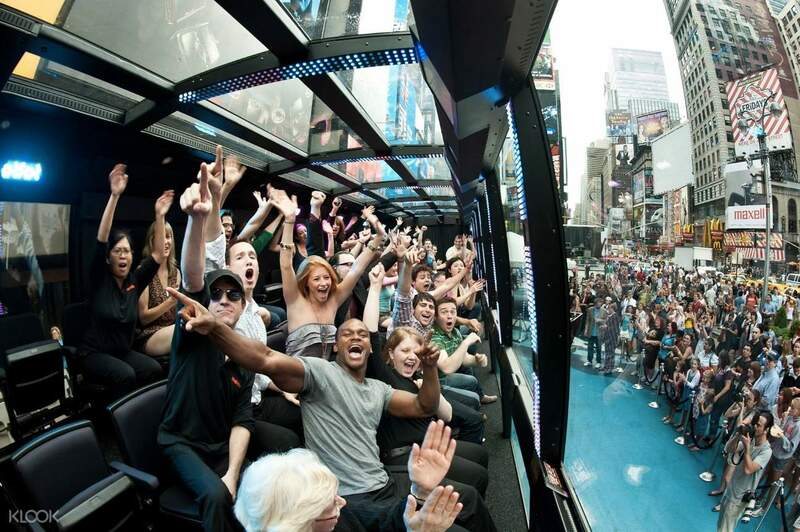 Get an interactive entertainment experience when you join tours from THE RIDE! Please allow extra time between the conclusion of your Ride and your next activity such as dinner reservation, spa appointment, theater tickets etc. Great experience to tour around NYC. It’s about driving around Time Square twice. The interesting part is that there are some entertainers on the street to interact with people on the Ride. Good to take part in during the cold weather cause passengers don’t have to get off the shuttle. Great experience to tour around NYC. It’s about driving around Time Square twice. The interesting part is that there are some entertainers on the street to interact with people on the Ride. Good to take part in during the cold weather cause passengers don’t have to get off the shuttle. Almost 1 hour delay. Standing on the cold ground is terrible. Almost 1 hour delay. Standing on the cold ground is terrible. I do not know English so I have to get to know it ... I was asleep and bored. I walked around before going around 5th Avenue, Chrysler, the Empire State Building, Rockefeller Center. So I did not have fun. If you want to ride this, take the first day !!! 영어를 모르니 저에게는 타봐야 알아들을 수가 있어야지... 전 타면서 잠오고 심심했어요... 저는 그 전에도 걸어다니면서 5번가, 크라이슬러, 엠파이어 스테이트 빌딩, 록펠러센터 돌아 다녔어요. 그래서 그런지 전 재미가 없었네요. 만약 이거 타고 싶다면 첫날 타세요!! !